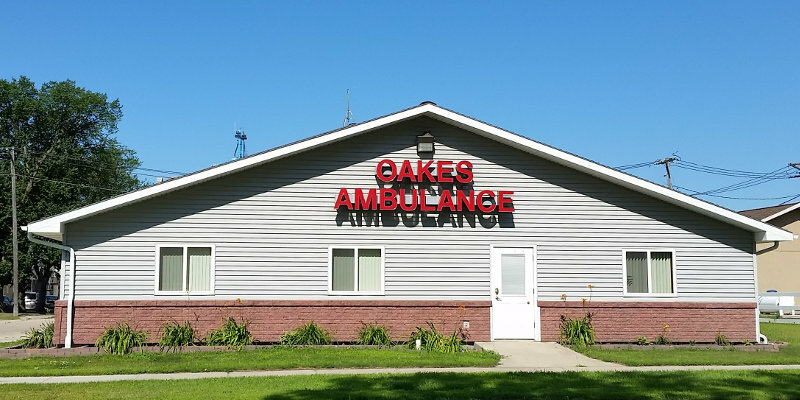 The dedicated volunteers and staff members of the Oakes Ambulance Service strive to provide the best possible care to the sick and injured patients in the area and surrounding communities. The Oakes Ambulance Staff is 90% volunteer and is occasionally assisted by the Oakes Fire District. The First Responders and EMT-B's provide care that is outlined in the DOT curriculum. The first responder has participated in a 40-hour course that reviews much more than the basic first aid level. The course work includes review of common medical emergencies, how to treat the trauma victim and get an overview of the EMS system. This level is common for police, fire or someone getting started in the primary car level program. The EMT Course is a 120-hour course that educates the EMT to provide out-of-hospital emergency care or Basic Life Support (BLS). You will learn how to assess a patient for injury or illness, administer CPR, control bleeding, maintaining airway patency, administer a limited number of medications, and prevent shock. You will be able to respond to respiratory, cardiac, and trauma emergencies. The course will cover anatomy, physiology, fractures and dislocations, childbirth, pediatric emergency care, applying splints and bandages, and moving and transporting patients. Once you become an EMT, you can consider advancing to the other levels of EMS including Advanced EMT and Paramedic. The EMT-I's can provide the same care, in addition to IV's access, advanced airway management, cardiac monitoring and administration of dextrose. The Paramedic's provide advanced treatment including: administration of medications, cardioversion, chest decompression and advanced airway. Oakes Ambulance Service conducts various education seminars in-house, at the schools, and elsewhere in the community. CPR is conducted at various times throughout the year. Call if you are interested in becoming CPR certified. The Oakes Ambulance Service Medical Director is Dr. Rup Nagala. Curt Halmrast, Paramedic and President of the ND EMS Association.